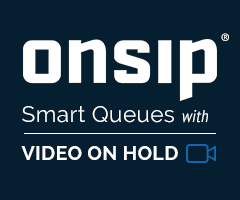 OnSIP Smart Queues pave the way for the next generation of video calling, including video on hold. Unified Communications as a Service (UCaas) provider OnSIP announced today that TMC, a global, integrated media company helping clients build communities in print, in person and online, has named OnSIP Smart Queues as a 2016 WebRTC Product of the Year Award winner. Queue callers can watch a YouTube video as they wait in the queue instead of hearing standard on hold music. With Video on Hold, businesses can play commercials, educational clips, and social videos. When a representative picks up, the queue video is replaced with the live video chat session. Managers can supervise real-time queue activity and monitor, whisper, and barge into a call right from their browser. Agents can accept HD voice and video calls from the queue right from their browser. The heart of these capabilities is the OnSIP app. Free to customers, the OnSIP app is a browser interface that can complement or fully replace the business deskphone. It is a one-stop application for video chat, extension dialing, PSTN calling, team presence, voicemail management, and the Smart Queue dashboard. With the OnSIP app and Smart Queues, OnSIP is on the forefront of the web-based unified communications movement alongside platforms such as Skype for Business and Dialpad. These applications digitize and simplify the phone system, require no hardware, and blend the lines between the traditional PBX and modern business collaboration. OnSIP has just added call center functionality to this space with Smart Queues. Click here for more information about Smart Queues. Founded in 2004, OnSIP is a leading provider of Unified Communications as a Service (UCaaS) to over 45,000 businesses. OnSIP® business VoIP phone service customers enjoy the benefits of an on-demand phone system without the traditional high cost, burden, and inflexibility. The company also offers a cloud platform and simple APIs for developers to rapidly and affordably build real-time communications applications of their own. For more information, visit http://www.onsip.com.